This month’s Canola Watch will feature highlights from Canola Watch Live! The Canola Council of Canada agronomy team along with guests Murray Hartman, Scott Meers, Mike Harding, Cindy Grant and John Heard presented a live version of our Canola Watch conference call at FarmTech 2014. 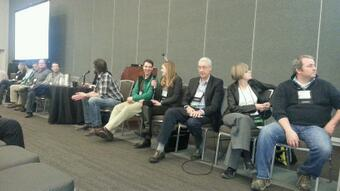 @DocCamiRyan, who will be speaking at the CCC Convention in San Antonio later this month, took our photo (see above) and tweeted that it was the record longest panel. The discussion included talk about crop rotation, swede midge, bertha armyworm thresholds, pollinator protection, and how to effectively use your smart phone and camera for accurate long-distance diagnostics. We also went off on a tangent about fertilizer plans heading into 2014. Moderator Jay Whetter asked the panel, “If growers are looking to increase (or trim) fertilizer investment by $10 per acre in 2014, what should get increased (or reduced) first — nitrogen or phosphorus?” Murray Hartman answered with “potassium,” noting that many growers were spending money on K fertilizer even though it rarely generates increased canola yield. Twitter is an effective way to share agronomy information and photos, ask questions, and get useful links. And you don’t have to actually “tweet” anything to benefit from Twitter. Sign up for free at twitter.com. Search by “hashtags” such as #canola and #westcdnag to filter the vast quantity of information. Follow @CanolaWatch to see what we’re saying on Twitter. The CCC agronomy specialists are also on Twitter. Click here to find their Twitter handles and other contact information. 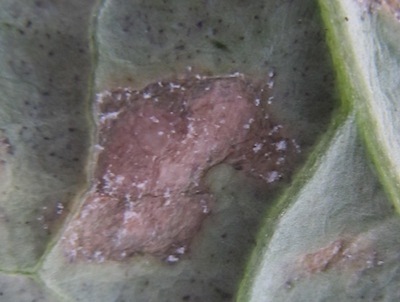 Crop diagnostics often come down to good photography skills, especially since so many people have smart phones with cameras, and since agronomists cannot get to all fields in a timely manner. Swede midge caused some yield loss in northeast Saskatchewan in 2013, and caused heavy yield losses in the major Ontario canola growing region. Swede midge’s flexible biology could make it well adapted to the Prairies, like wheat midge is today. Insecticides are registered for swede midge, but there are no viable recommendations for control at this point. There are no established economic thresholds or proven best timing for foliar sprays. The good news is that while their range seems to be expanding on the Prairies, swede midge numbers remain fairly low so far. 1. 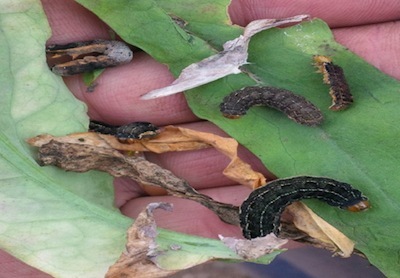 Lower canola prices will mean higher thresholds for bertha armyworm. Click “read more” to see the table. 2. Bertha armyworm populations tend to build for three years, then drop due to disease or beneficial insects. Areas that have had three years of building infestations may see the bertha armyworm threat reduced in 2014. Other areas are still building toward the peak. Your local risk is difficult to predict until adult counts start in the summer. —Use economic thresholds when making control decisions. Remember: Threshold covers cost of application. No profit! —Use the least toxic option registered for the crop. —Take measures to minimize drift. Wind speed/direction, drift reducing nozzles. Read Tom Wolf’s drift management tips. —Apply after 8:00 p.m., or into the evening and at night, when bees are less active in the field. 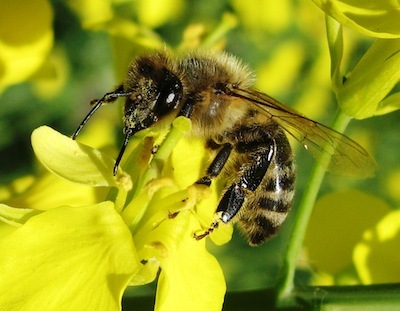 —Communicate with beekeepers in your area, especially before you plan to spray your fields. That will give them a chance to move, or cover hives, or suggest safer products. —Please report any bee kills here.